If you're panning to travel in Europe Vesping offers the most inclusive tour especially in Barcelona and willing to cater your needs from personal tour to group tour. It depends what is your preference and you can contact them if you want to discuss your travel plan in Barcelona. Going to Barcelona has a lot things to see and the main language is Spanish. 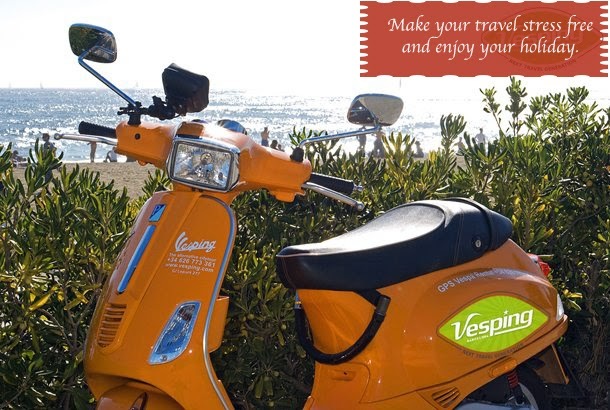 Booking to Vesping would make your travel stress free and enjoy your holiday through rent scooter Barcelona. If you are a person who enjoy a self guided tour then you can rent a Vespa with a simple GPS Satellite Navigator you can plan your excursion and visit all the hidden gems you want. They're not just a booking tour but they are their to make your holiday memorable, enjoyable and see the beauty and experience the culture and the best of guided tour Barcelona. I love to explore a new place all by myself but I am not very confident in my driving skills, especially with a scooter! I wish I could see Barcelona someday, must be beautiful out there. Motorbike tours are really convenient, it will give you a feel of the place like a local. I just have some reservations, though, because my local driver's license might not be acceptable in other countries. Ooohh! That would be so cool to see Barcelona in a scooter. Only that my hubby has to drive it coz I don't know how to drive one.